The Florida Wildlife Rehabilitators Association (FWRA) is a nonprofit organization dedicated to the unification, education and dissemination of information to all wildlife rehabilitators in Florida. To provide an organizational structure within which various individuals and organizations involved in the rehabilitation of injured, orphaned and displaced wildlife may exchange information. To provide training and assistance to individuals and organizations involved in the rehabilitation of injured, orphaned and displaced wildlife. To increase public awareness through educational means of and support for the activities of wildlife rehabilitators. To engage in such other activities as are permitted by Florida Law. Owner of Hirschfeld Veterinary Consulting, Inc. Certified in acupuncture and cold laser therapy, providing in home therapy, nutritional counseling and euthanasia services in the south Florida area since 2003. Veterinary medical officer and disaster responder for VMAT and NVRT 3. Works as a per diem surgeon for non profits, shelters, private practices and wildlife facilities. Works as a consultant for FWS, FWC, shelters, wildlife hospitals and centers across the country. Veterinarian for Flamingo Gardens and privately owned, permitted captive wildlife. Board member of HDEC & Miami-Dade Community College Veterinary Technology Program. 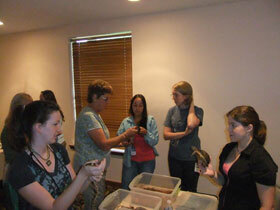 Holds USFWS & FFWCC Wildlife Rehab Permits, DEA License and USDA certification. Executive Director, Treasure Coast Wildlife Center USFWS & FFWCC wildlife Rehab & possession Permit, FL Class I, II, III License, Scientific Education Permit Eagle, venomous reptiles, conditional species Possession Permit Captive Wildlife Technical Advisory Group, FFWCC Health Department Rabies Task Force, West Nile Virus Task Force, Martin County Consultant to Martin County Sheriff’s Office - Animal Control Division Advisory group for animal care and control Martin County Board of County Commissioners. Involved in wildlife rehabilitation since 1990. Owner Sundog Veterinary Services, Inc. Offering per diem services to Wildlife, Zoo and Shelter facilities. First intern in wildlife medicine and surgery at the Wildlife Center of Virginia. Certifications in Technical Large Animal Emergency Rescue, Large animal therapeutic massage, Veterinary Dentistry, and Veterinary Ultrasound. 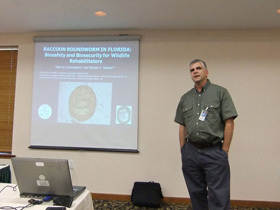 Former Director of Veterinary Services Wildlife Care Center (Now South Florida Wildlife Center). Former contract or staff veterinarian for Flamingo Gardens, Brevard Zoo, Florida Wildlife Center. Involved in wildlife rehab since 1988. Involved in wildlife rehabilitation since 1997. Home based Sub permitted Wildlife Rehabilitator for The Wildlife Rehabilitation Center of Central Florida. Christmas, FL. Retired marine trade regional sales manager. Orlando, FL. B.S business management/economics Rollins College. Rehabilitation Supervisor, Audubon Center for Birds of Prey, Maitland, FL. FWS & FFWC wildlife rehab & possession permit, Eagle exhibition permits Wildlife Alert Committee Member. Involved in wildlife rehabilitation since 1974. Director, Creature Safe Place, Fort Pierce, FL USFWS & FFWCC wildlife Rehab & possession Permit St. Lucie County SART. Director, Wildlife Sanctuary of Northwest Florida, Inc., Pensacola, FL USFWS & FFWCC wildlife Rehab & possession Permit, FL Class I, II, III License, Eagle possession. Involved in wildlife rehabilitation since 1994. USFWS Migratory Bird Rehabilitation Permit; US Virgin Islands DPNR Bat Rehabilitation and Possession Permit; Virgin Islands Audubon Society Board Member. Other activities: Amateur Radio Emergency Services; St. John Amateur Radio Club; Virgin Islands Amateur Radio Weather Net. Raptor Clinic Technician/Volunteer & Intern Coordinator. Audubon Center for Birds of Prey. B.S. in Environmental Studies. Wildlife Education permit. Involved in wildlife rehab since 1999. Raptor Veterinary Technician. Audubon Center for Birds of Prey, Maitland, FL. 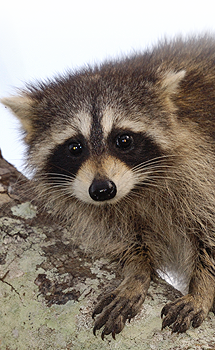 Involved with wildlife rehabilitation since 2001. Certified Wildlife Rehabilitator, Clinic for the Rehabilitation of Wildlife, Sanibel, FL. Involved in wildlife rehabilitation since 2013. Hospital manager, Clinic for the Rehabilitation of Wildlife, Sanibel, FL. Involved in wildlife rehabilitation since 2014. Supervisor of Animal Care, Wildlife Sanctuary of Northwest Florida, Inc., Pensacola, Fl. BS in psychology. Involved in wildlife rehabilitation since 2011.